I love doing custom work. While there can be restrictions, there is a lot of freedom as well. Working within parameters, but with a good dose of “but I really love what you do, so I trust you” is the best way to work! 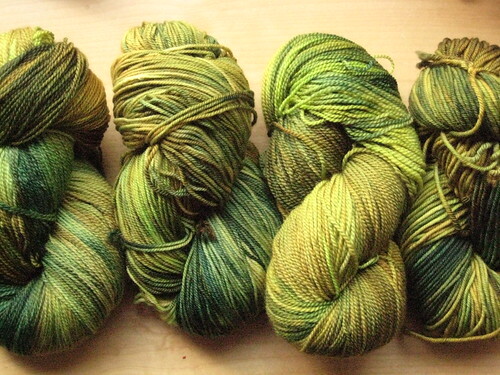 Recently three good friends asked me to do some custom dyeing for them. A sweater’s worth of MCN Sport. 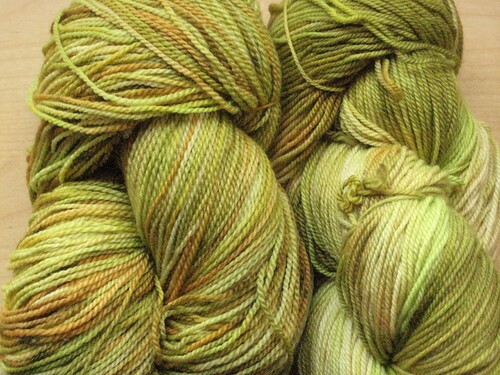 Molly asked me to dye some of her handspun. 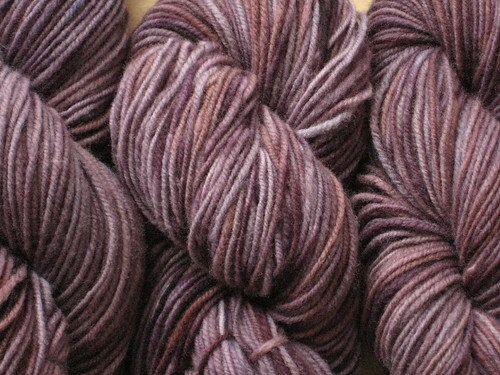 We decided on smoky, dusky plums. 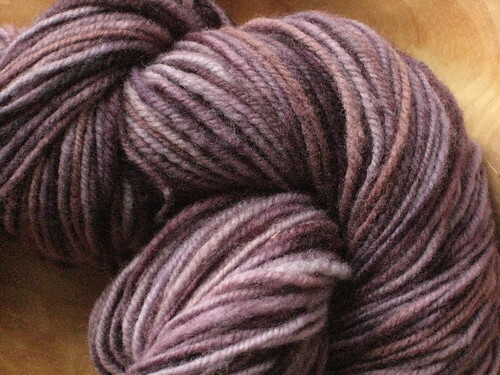 And then I went to pick up Molly’s handspun [insert dropped jaw and audible gasp] which was STUNNING. 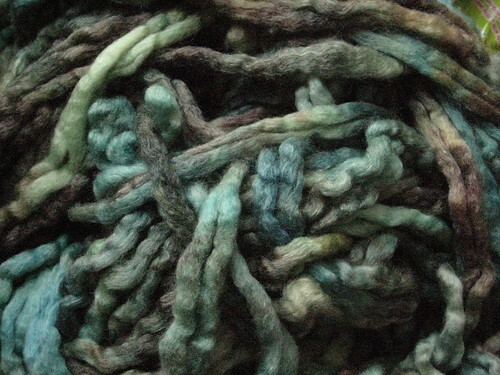 Seriously, the woman makes gorgeous yarn. It almost didn’t make it back to her. Let’s look a little closer, shall we? I have to admit, custom work for friends is both wonderful and terrifying. 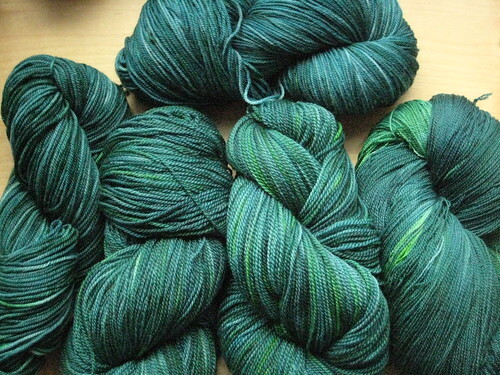 Even though I pretty much knew each of these lots was perfect for the recipient, it wasn’t until they each jumped up and down, hugging their yarn and fibre, that I actually knew. And really, there is no better feeling than seeing someone LOVE something that you’ve made. Some great new colours in this update, as well as some old favourites. 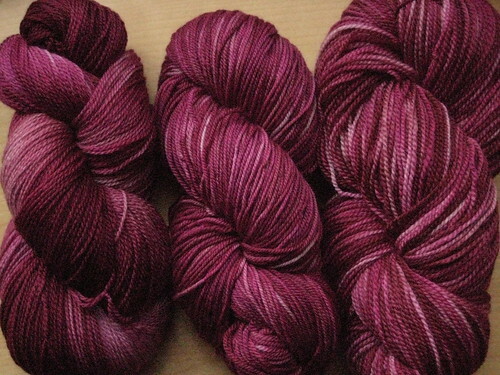 Full details about yarn bases and prices is here. To join my mailing list and hear about updates: indigodragonfly.K AT gmail.com. 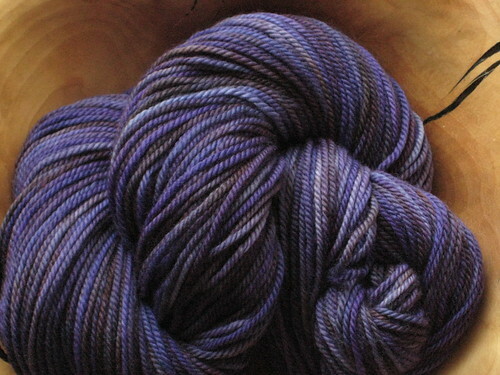 If you’re interested in purchasing any of my yarn and/or roving, please send me an email at indigodragonfly.K AT gmail.com (replace AT with “@”, no spaces) indicating what you would like. 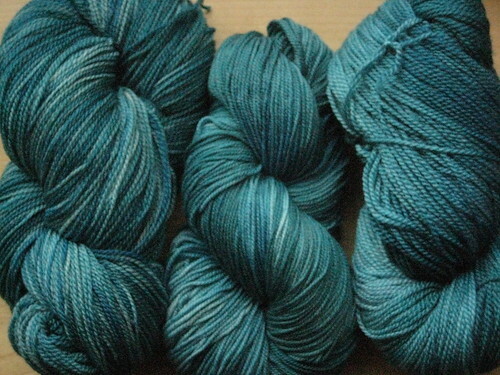 First email request for each yarn/fibre secures it. I will send you a paypal invoice for the full amount plus shipping and ship the packages off as soon as possible! Shipping charges to the US will start at $5 (1 skein of sock yarn) or $7 (1-2 batches of most rovings/1 -2 skeins of larger skeins of yarn). Canada Post doesn’t make shipping charges for Canadian or International packages easy, so I will send you a shipping quote for your order for your approval. Sound good? Best attempts are made to photograph colours accurately, however colours do differ from monitor to monitor (I’ve checked). 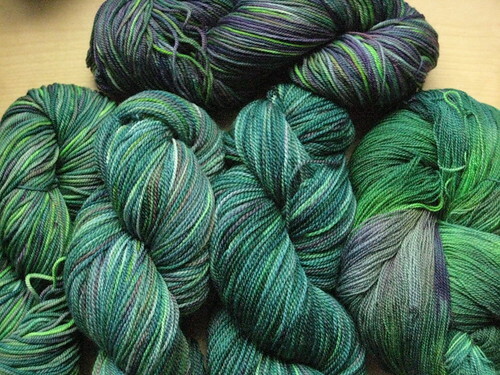 I’ve also described the colours…and hope that helps. Custom orders are always welcomed! Just email me with what you have in mind. 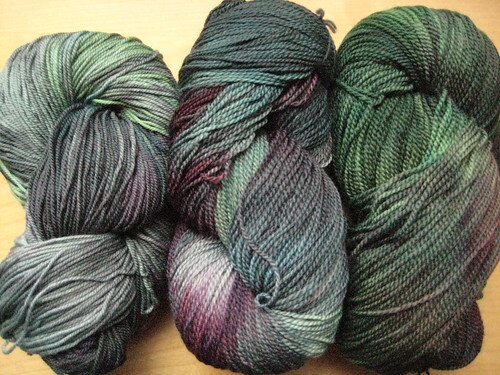 Purple, acid green, turquoise and red washed in shades of grey...the colours mix differently in every skein!